Koda, a proposed 17-story condominium project slated to be built on top of a parking lot next to Hirabayashi Place, is a significant step closer to being built. 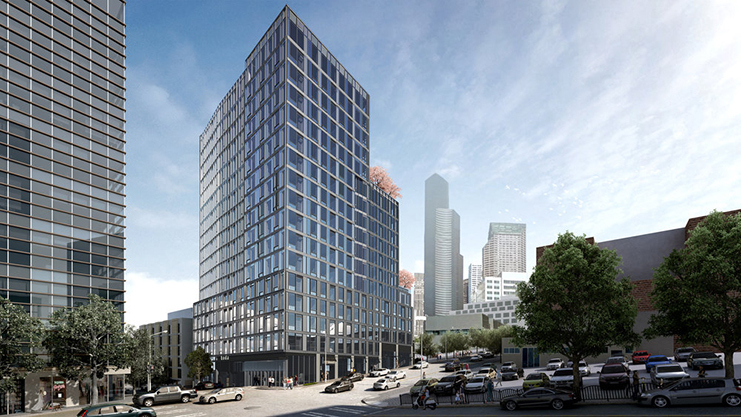 On January 22, Koda’s developers were issued a certificate of approval for final design by the International Special Review District (ISRD) Board, which regulates new constructions in the Chinatown International District (CID) with the goal of preserving the CID’s Asian American characteristics. A handful of people spoke against the project during public a comment period. For at least a year, the project has consistently been opposed by some during ISRD meetings. The project, from Da-Li Development USA, already had the go-ahead from the ISRD Board to work on final design. The Board approved its use of the project as a condominium project in October 2018 after preliminary design review. The approval for most of the final design on January 22 marked the end of roughly two years of meetings before the Board. Promotional materials for Koda advertise its location in historic Nihonmachi (Japantown). During a final briefing before the ISRD Board, representatives from Koda described planned design elements that pay homage to Japanese culture. One of these is a public art installation. During the briefing a representative from Koda suggested a sculpture of a suitcase, to honor the incarceration of Japanese Americans during WWII, as one idea. Others brought up concerns about the affordability of the units, and whether it is appropriate for the neighborhood. These issues were not part of the ISRD Board’s review process, as they fall outside its purview. “The board does not have jurisdiction over affordability levels,” said Rebecca Frestedt, ISRD Coordinator for the Department of Neighborhoods, something she’d echoed at several previous ISRD meetings related to large market-rate development projects. Leslie Morishita spoke against the project on behalf of InterIm Community Development Association (CDA), where she works as real estate development director. She acknowledged that InterIm’s opposition is for reasons outside the Board’s purview. InterIm is calling for the ISRD Board to expand its purview to include equitable development criteria, and the cumulative impacts of speculative, high-rise developments. “Through observing the Koda project progress over the last year plus, it seems to us that they see this ISRD process as simply a bureaucratic hoop to jump through before they can build their building – a game of words and smoke and mirrors,” Morishita said, reading from a statement. Two people spoke in favor of the project, including Tomio Moriguchi, retired CEO of Uwajimaya. “I think people that move in here will be tax-paying people, they’ll shop, and I think it’ll be good for the community,” Moriguchi said. Talamoni worried about the Board imposing its own design ideas on something that would have an impact on the community. “Me personally, I don’t know katakana, I don’t know kanji, and so for me to suggest one way or the other just wouldn’t be appropriate,” Talamoni said of final design of the Koda sign. Talamoni encouraged the public to engage with the developers and suggest what they want to see, so that the Board can try to find a middle ground. Before voting, Board member Stephanie Hsie emphasized the value of the public continuing to engage outside of the ISRD process. Board members hesitated slightly before making a motion to approve final design for the project, but the motion passed unanimously. Frestedt noted that more development projects are coming to the neighborhood, and encouraged the community to participate in the process. The ISRD Board issued a certificate of approval for final design of materials, finishes, colors, landscaping, right of way improvements and the plan for a sign outside the building. 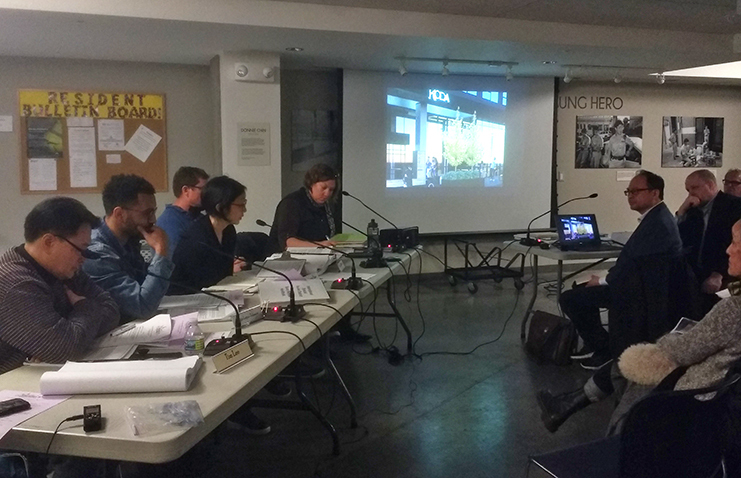 It did not issue approval for public art planned outside the project, and the actual signage graphic. For these, representatives from Koda will need to appear before the Board again. The project will contain 203 units. As of March last year, 95 percent of the units are already reserved, according to Curbed Seattle. Koda expects the project will be completed by 2020, according to its website.